NOAA’s Central Pacific Hurricane Center today announced that climate conditions point to a near-to above-normal hurricane season in the Central Pacific basin this year. 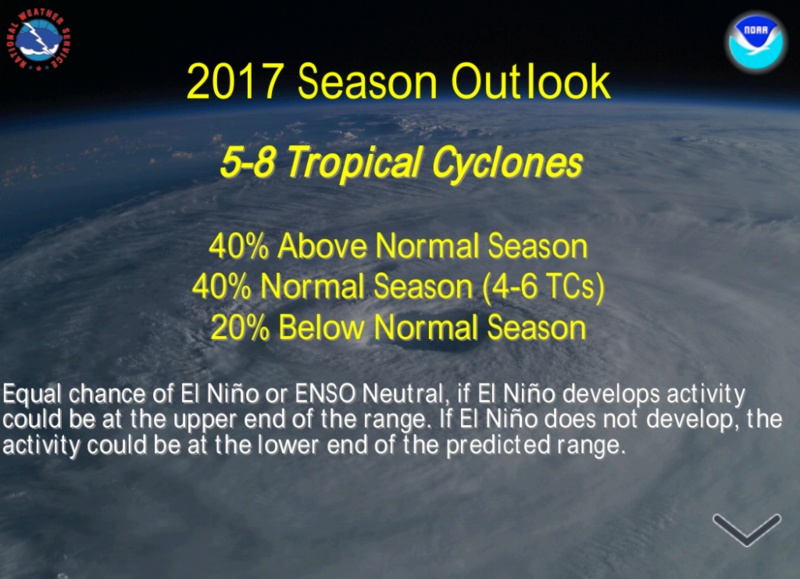 For 2017, the outlook calls for a 40% chance of an above-normal season, a 40% chance of a near-normal season, and a 20% chance of a below-normal season, with 5 to 8 tropical cyclones expected to affect the Central Pacific. An average season has 4-5 tropical cyclones, which include tropical depressions, tropical storms, and hurricanes. from the Eastern Pacific into the Central Pacific. The Central Pacific basin may also be shifting toward a longer-term period of increased tropical cyclone activity, in response to changes in global sea surface temperatures patterns in both the Atlantic and Pacific Ocean which historically last anywhere from 25-40 years. 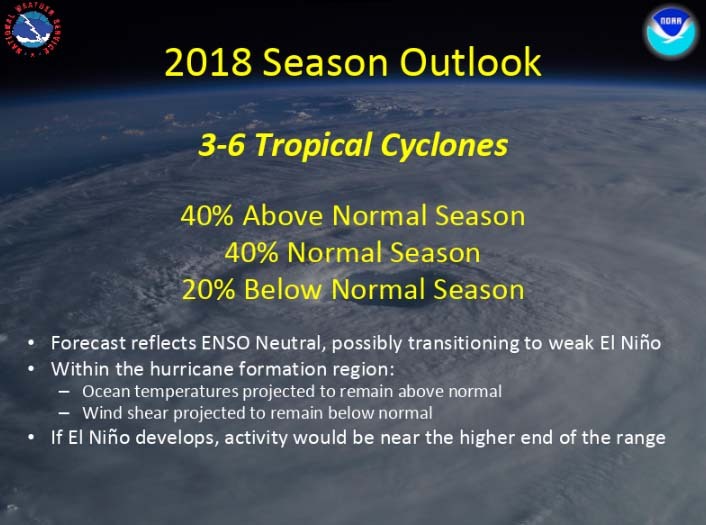 This outlook is a general guide to the overall seasonal hurricane activity in the Central Pacific basin and does not predict whether, or how many, of these systems will affect Hawaii. Hurricane season begins June 1 and runs until November 30. 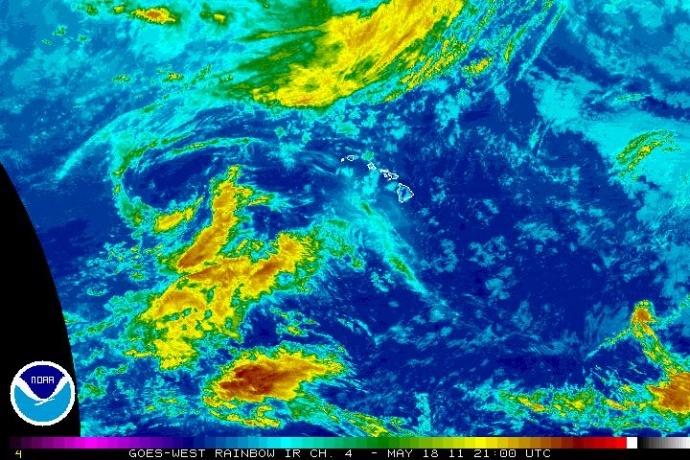 NOAA issued its Central Pacific hurricane outlook at a news conference in Honolulu, and urged Hawaii residents to be fully prepared before the hurricane season. 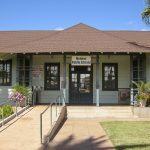 “The 2017 hurricane season marks the 25th anniversary of Hurricane Iniki, which brought life-changing impacts that have lasted more than a generation,” said Chris Brenchley, director of NOAA’s Central Pacific Hurricane Center. “We all need to plan and prepare right now for the upcoming hurricane season, which could become the third above-normal season in row,” said Bell. The Federal Emergency and Management Administration (FEMA) has a web site ready.gov/prepare, which provides information on the basics of each type of hurricane hazard, how to protect yourself and your property, and what steps to take now. The Central Pacific Hurricane Center continuously monitors weather conditions, employing a network of satellites, land- and ocean-based sensors and aircraft reconnaissance missions operated by NOAA and its partners. This array of data supplies the information for complex computer modeling and human expertise that serves as the basis for the hurricane center’s track and intensity forecasts that extend out five days. The seasonal hurricane outlook is produced in collaboration with NOAA’s Climate Prediction Center – a division of the National Weather Service.